Much of the world starts the day with a hot beverage, and coffee gives many of us the lift we need to get going. Investing in a great drip coffee maker makes sure you get a consistent cup of hot, fragrant coffee with every brew. What is the best coffee maker? Our top pick is the Moccamaster KBT for overall speed and quality control (handmade). In this guide we will help you discover more of the best drip coffee makers through in-depth explanations, tips and coffee maker reviews. What is a drip coffee maker? Drip coffee is made by running hot water over ground coffee beans, then filtering this beverage into a glass carafe on a burner or into a thermal carafe. Drip coffee makers are the most common coffee making tools for home and office. Why Get A Drip Coffee Maker? In our coffee maker comparison chart, brew temperatures can vary and are not exact. Temperatures are affected by your location altitude and working order of the machine. For some units, only the temperature of the coffee within the carafe was used. Brew times are for 1 full carafe. Some models have reservoirs that preheat water and deliver brewed coffee faster than other models. Sometimes the manufacturers listed brew time is from using preheated water (on demand brewing or pre-infusion). Each brand and model may have different sized carafes, but generally range between 5 and 12 cups. 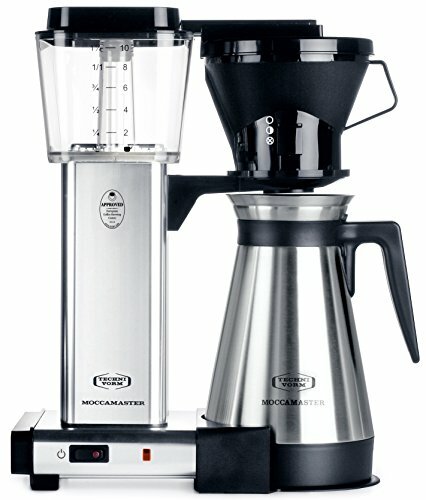 The Moccamaster has a consistent brewing temperature of between 195 and 205 F and brews a carafe between 4 and 6 minutes. There's a manual drip stop controls the drip rate on the side of the filter basket. For the serious coffee connoisseur, this is perfect. Most other coffee makers have more temperature variance, less optimal brew temperatures, and heat water much slower. While extraction time and temperature are perfect, the shower head on this unit may not distribute water to your coffee grounds perfectly. You can offset this by leaving the filter basket closed until all of the grounds are saturated. For best results, you’ll have to stir your coffee in a closed filter basket for about thirty seconds before leaving the filter open for the rest of your brew. This adds an extra step to making your coffee, but it's well worth it to get perfect extraction every time. A small amount of water is left in the tube after each brew. You can purge this by using the machine to wet your filter before you brew -- this ensures that the leftover water is fresh each time. Each Moccamaster is handmade in the Netherlands. This may make it more expensive than similar models, but it also results in much tighter quality control. Technivorm's 5 year warranty speaks to their confidence in the quality of their products. The Moccamaster KBT disassembles easily for cleaning, but it has quite a few parts which can get a bit hard to track of. The Moccamaster is fairly simple in that it just has an on/off switch and a safety switch on the side of the machine that prevents it from starting without a carafe in place. There aren’t any programming options to set it the night before and have coffee when you wake up. The Bonavita BV 1800 is a no-frills unit. A single switch begins operation, and with no brew stopper, you wait until it's done. A full brew takes between six and seven minutes. Water comes out of the shower head at between 195 and 205 F, which falls in range with what experts consider to be ideal. The resulting coffee in the carafe is about 185 F, a bit too hot to sip without adding cream. If it wasn't for the corrosion issue we’re about to get in to, this would be a perfect drip coffee maker for serious enthusiasts. However, for the everyday coffee drinkers like us, it might be a great choice. Check out the difference between two similar Bonavita models, the Bonavita bv1900ts vs bv1800 for comparison. The Bonavita BV 1800 features an aluminum-clad copper coil in direct contact with a steel pump and steel mount screws. This will invariably result in galvanic corrosion. It's the same process that turns battery terminals gross. What the heck? Basically, allowing certain types of metals to make direct contact while being subject to an electrical current (the kind you might run through a heating coil) and an electrolyte (tap water will suffice here) is not good in the long term. Due to Bonavita's design, this will eventually happen inside of this coffeemaker. Don’t worry because galvanic corrosion is not a fast process. Practical wisdom suggests that the heating element will remain functional, on average, for a bit over two years. This is the length of Bonavita's warranty. To be honest, we expect to have to replace a coffee maker by then anyway. It might be possible to prolong the corrosion issue by using distilled water because pure water is not a good conductor of electricity. Galvanic corrosion cannot occur unless the water has impurities dissolved in it. Water that is filtered, but not distilled, can still be conductive enough to serve as a weak electrolyte and drive the reaction. Recently, the Bonavita BV 1800 has been incredibly popular online. We think it’s a great coffee maker, aside from the issue addressed. However, it’s not as big of a deal as one might think but we thought it was important to address.​ Not interested in this machine? See our Bonavita BV 1900 review for an in depth look at their newer model. The Cuisinart DCC-3200 has user-friendly features built in such as an auto-start feature that syncs the time your coffee finishes brewing to whatever time you choose. So you can have a fresh pot as soon as you wake up each morning. There's an optional alarm that goes off when your coffee is ready to drink. The hot plate has a shut off timer, meaning you can keep your brew hot while you do daily chores without wasting electricity after you leave for work. Something we don’t see on other models is that the machine tells itself when it needs to be cleaned and has a special mode to make the process easier for you. The Cuisinart DCC-3200 takes about 17 minutes to brew a full pot of coffee. It's got an optional "bold" setting that helps with water temperature and extraction time, but this unit still leaves quite a lot to be desired on both of those fronts. An adjustable hot plate keeps your coffee warm after you've brewed it. We like the DCC-3200 quite a bit and definitely a coffee maker to consider. See our Cuisinart﻿﻿ DCC-3200﻿﻿ review for a more in depth look at this unit. 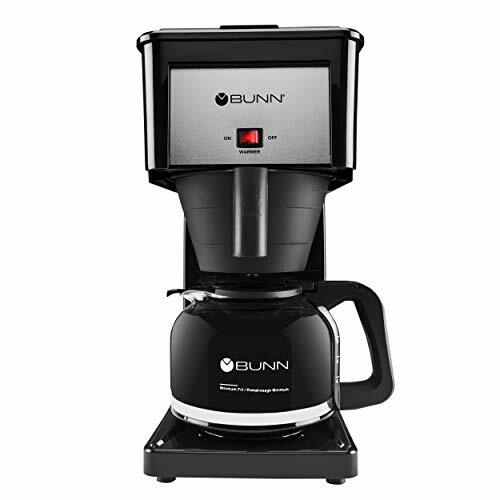 The Bunn GRB Velocity's claim to fame is the extreme speed at which it brews a pot of coffee. It takes three minutes to brew a full pot from an ideal start. In order to achieve this, it keeps a tank of hot water on standby. If you want to brew a pot of coffee starting with cold water and an unplugged machine, it'll take something closer to 20 minutes. The water temperature is about optimal at 200F and the extraction time works out to be just about right. This means that you'll get perfect coffee every time. It's even got a spray head to give you even extraction across all of your grounds. For a home or office full of serious coffee drinkers, this may be a pretty good investment. Because it keeps a reservoir of water hot all day, you're wasting quite a lot of electricity if you're not making a lot of coffee. In a moderately populated workplace or a home where you find yourself going through several pots of coffee each day, this isn't a big deal. If you're only making a pot for yourself each morning it may or may not be worth it. Of course electricity costs vary depending on your location. It's worth noting that if you have soft water or brew decaf, you'll need to contact Bunn and get a different restrictor sprayhead in order to get your brew time right and not overflow your filter basket. They're happy to ship one to you. There aren't any fancy features on this coffee maker. The 3 minute brew time makes auto-start a bit silly, so it's not included. The only controls are an on-off switch (for the warming plate) and the lid at the top that starts the brew process. Mr. Coffee is one of the most popular drip coffee makers on the market. These units are available in a variety of sizes and generally come with a glass carafe, auto-shutoff burners and the chance to sneak a cup while brewing. Keurig Coffee Machines brew single cups of coffee and other beverages from small plastic cups inserted at the front of the machine. You can also purchase personal, refillable cups to reduce plastic waste and expense. One of the benefits of owning a Keurig is that you can treat your guests to more than coffee, as these units will also make delicious hot cocoa and apple cider. A drawback is that if six people want coffee at the same time, you'll have to brew six separate cups. Update: Some Keurig machines are able to brew a carafe of coffee. 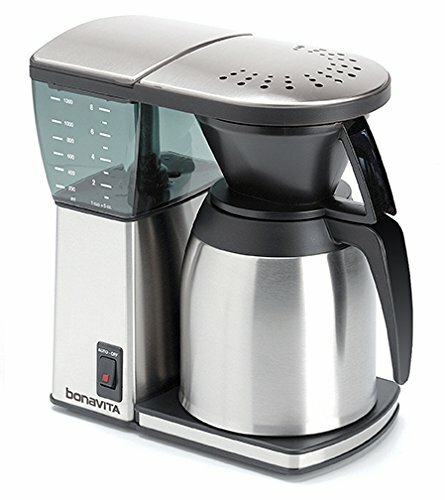 Bonavita drip coffee makers are available in a variety of sizes and styles. Their line of thermal carafes is particularly varied. 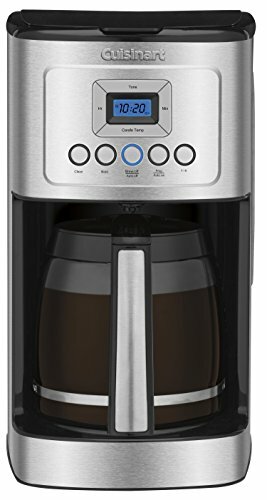 If you need an 8 cup capacity but don't have much counter space, the BV1800SS coffee maker is less than 9 inches / 23 cm deep. Breville coffee makers are visually striking and feature a brushed nickel finish. These units include built-in grinders and flavor controls. For smaller households, the YouBrew offers coffee fans the chance to brew a single cup or small carafe of delicious coffee. Hamilton Beach has a long history of making kitchen appliances and has a variety of drip coffee makers. A unique unit available from them is the 48464 BrewStation, which brews and holds coffee until you're ready for a cup. If you've ever struggled with carafes that drip and splatter, this unit may be just the one for you! Bunn drip coffee makers are available in commercial and home format. This is often the coffee maker put to use in many restaurants. Home brew units can be purchased with a direct water line, so if you've got a need for hot water in addition to coffee, installing one of these units will cover you! Cuisinart kitchen appliances are often the go-to workhorses for many cooks, and their drip coffee makers can last for years. Even if you encounter issues, you maybe be able to easily solve them using our Cuisinart coffee maker problems and troubleshooting guide. An SCAA (Specialty Coffee Association of America) approved drip coffee maker cost a bit more than the standard machine purchased at your local big box store, but there are terrific benefits. For that expense, you get a showerhead method of brewing, designed to bring out the best flavor of the beans and a finished temperature guarantee of between 195 to 205 degrees Fahrenheit / 91 to 96 degrees Celsius. Additionally, many SCAA certified drip coffee makers brew directly into a carafe, not a glass pot on a burner. If you need to walk away from your coffee maker, there's no risk of scorching or cooking down the remaining beverage. What is the best coffee maker for my home or office? Keep the following features and specifications in mind when choosing a coffee maker. For larger families, offices, or heavy drinkers, the size of the carafe and speed in which coffee is brewed will be important. For others, making a single cup of coffee at a time may be more ideal. There are several options to consider when purchasing your automatic coffee maker. How many coffee drinkers are in your household or office? How much coffee do you currently go through per day? You can purchase any size from a 1 cup coffee maker to a 12 cup coffee maker. Do you prefer a glass coffee carafe, or a thermal coffee maker carafe? When choosing between a glass carafe and a thermal one, it's important to keep in mind your daily habits. If your day tends to start in a rush, with children to drop off, work deadlines to meet and a schedule to keep, a drip coffee maker with a carafe can be an excellent choice. For those of us who've burned up brain cells worrying about whether or not we left the coffee pot on, there is an answer. A drip coffee maker with a thermal carafe has no burner. Glass carafes are probably the most popular choice since they are typically less expensive than thermal carafes. You may also be familiar with some of the problems with them such burnt coffee in the bottom or glass carafes being broken by someone rinsing the hot glass under cold water. A thermal carafe can be an excellent choice because there is no risk of leaving a glass pot on a hot burner; once the coffee brews, all the hot liquid is contained. Coffee makers occupy dedicated real estate on your counter, and many high end coffee makers have a bigger footprint. Paper Filters – These are the most abundant and cheapest options for filtering coffee. Most coffee machines have the option of using paper filters even if they are designed to use mesh filters. Generally they do a great job and the leftover coffee ﻿﻿﻿﻿grounds and filter can be composted or tossed in the trash after each use. Mesh Filters – The benefits of mesh filters are that they don’t need to be replaced after each use. Once your coffee has brewed and the filter has cooled down, you can toss the grounds in to your compost bin or garbage and then cleaned. On the other hand, replacing these filters can be expensive if they begin to rust or become damaged. Which is better? We prefer the classic paper coffee filters because there is less chance for grounds ending up in our coffee. If you were to accidentally damage a mesh filter, a tiny hole may allow grounds to pass through and a replacement can be costly. Several drip coffee makers include a water filtration feature. This is a portion of your coffee maker you'll want to monitor carefully and change as instructed by the manufacturer. Greatly improve the flavor of your coffee. Help prevent your coffee machine clogging up. If your coffee machine doesn’t come with or able to be hooked up with a water filter, you can always opt for buying a separate water filter pitcher such as those offered by Brita or ​Mavea. Many coffee maker brands include additional features such as timers or grind and brew. While this can mean that you wake to the aroma of freshly ground, freshly brewed coffee wafting through the house, you can also have an unusable coffee maker if the grinder feature fails. Higher end coffee makers offer ways to control the strength of your brew by calculating the amount of water to be used versus the amount of coffee added. This is especially true for grind and brew models. The auto-shutoff feature can be nice if you need to sneak a quick cup, but if you or members of your household are not accurate about lining the pot back up under the drip basket, you'll have wasted coffee and a terrible hot mess. Additional modern add-ons include coffee makers with wi-fi access, remote control coffee makers, and coffee makers with phone apps. You'll still need to attend to basic preparation, including adding water and coffee, but these features can offer users the chance to start their day on the right footing. For many of us, coffee is part of our daily ritual and the fuel that gets our brains going. If you're a fan of this very necessary beverage, investing in a great drip coffee maker is a gift to yourself that you should indulge in.